A mum from Stansted was among over 1,500 students from City University London to graduate at ceremonies held in the capital recently. Michelle Shields (nee Dodwell) completed a Bachelor of Science in Primary Care (Practice Nursing) with flying colours, despite balancing her study with working setting up a construction camp in Outback Australia. Michelle, who was born and raised in Stansted and still lives in Burton End, has over 25 years experience working in nursing and midwifery and is currently based in and around North London. She says the decision to go back to university was based on the need to re-launch her career. "I originally studied nursing in Chelmsford in the early 80s after working at Herts and Essex Hospital as an Auxiliary Nurse. More recently I graduated as a Midwife from the University of Limerick in Ireland and promptly went to work in the Australian Outback birthing Aboriginal women. It was amazing but I still felt I needed a challenge and decided to change my career direction." "I was lucky to be accepted to undertake a pilot course for a unique collaboration between Tower Hamlets Primary Care Trust and City University London, called Open Doors, which allows Registered Nurses with no previous primary care experience to become competent, autonomous practitioners within the GP setting. With the support of Open Doors and City University London I decided I would go on to complete a two year Degree course in this area." However, towards the end of the course, Michelle was offered a life changing opportunity to travel to Australia with her husband, where they would work together in the Outback to set up a construction camp to support the building of facilities for local Aboriginal communities. "It was a life changing opportunity and one I simply couldn't turn down. I rang my lecturer, Marie Hill, to tell her I would have to drop out of the course but she was determined that I not give up on gaining my Degree. Between us we determined a way that I could submit my final assessment whilst working on the other side of the world. "Living in Australia was an amazing experience, but very hard work. I literally took my 16,000 word portfolio with me to the Kimberleys, a really remote part of Australia and worked on it there in order to gain my Bachelor of Science. All my books, documents and laptop were packed into two suitcases which travelled around with me as my husband and I were flown from one remote area to another - they would have travelled thousands of miles. I was thrilled when I ended up graduating with a First." Michelle is now using the expertise she gained at City to train other nurses. "I'm now working for a private healthcare organisation training potential practice nurses. I'm also working in several GP clinics and putting my training to good use. I'm really glad my lecturer, Marie Hill, pushed me to finish my course - I have a lot to thank her for. Overall I was really impressed with the level of professionalism and flexibility within those who lecture and teach at City University London. I consider myself to be an advocate of their excellent teaching skills and continue to recommend the course to others," says Michelle. Celebrity stalking, especially the use of the internet by criminals looking to track down their prey, was the subject of Gabby Cox's studies. 22 year old Gabby Cox, from Bristol, was among over 1,500 students who graduated from City University London during ceremonies held in London recently. 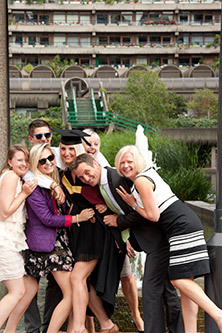 Accompanied by her mum, dad, sister, boyfriend, step-mother and step-sister, Gabby was very excited to be the first in her family to gain a Degree. Gabby, who grew up in Bristol where her family still lives, graduated with a First in a BSc in Sociology and Criminology. She achieved particularly high marks following her in-depth exploration of stalking in her final dissertation. "Issues to do with celebrity stalking are often in the news, particularly at the moment. I thought it would be really interesting to explore this issue from an academic perspective. "My dissertation focused on the fact that laws to do with stalking have hardly changed at all over the years. With new technology and cyber stalking growing in prevalence, I wanted to look at what changes could and should be made. It was a really fascinating topic to focus on and not the normal sort of thing you get to study at university. "I was really lucky to be able to arrange interviews with detectives from the Avon and Somerset and Wiltshire constabularies, who specialise in this area, as well with a representative from a major non-profit organisation, the Suzy Lamplugh Trust," says Gabby. Gabby says that although she was living away from home and missed her family back home in Bristol, moving to London to study was a great decision. "Studying in London was fantastic, living in the University Halls I made lots of new friends and it was a real advantage to study in such a diverse area, particularly when it comes to classroom debates about criminology and sociology as I was exposed to a lot of different views that I hadn't heard growing up in Bristol. I want to stay in London and am now searching for somewhere to live." Gabby also worked as a student ambassador during her time at the University, visiting schools to talk to year 10 students about what studying at university is really like. She says that she is hoping to eventually get a job in the police force. "Ideally I would like to work with the police or get a role in one of the government departments, so that I can really put what I have learnt into action. I'm really interested in criminology and will pursue a career in this area." A cub scout leader who has been working with children in the Essex area for more than seven years was among over 1,500 students who graduated from City University London recently during ceremonies held in London. 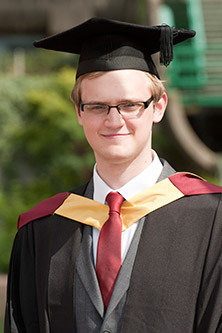 Daniel Sadler completed a Bachelor of Science in Psychology at City University London and is the first member of his immediate family to graduate from university. His proud mum, dad, and brother all joined him at the Graduation ceremony. During his studies Daniel has balanced his time with his commitments to the local scouts groups, where he is an Assistant Leader after joining more than three years ago. Daniel says studying psychology wasn't easy, but definitely worthwhile. "I initially considered studying Art, but after attending a University open day and hearing one of the psychology lecturers speak I decided psychology was the perfect course for me. Studying at University was difficult but I really enjoyed the course. The content was really diverse and the lecturers were great. I particularly enjoyed the modules on social psychology and learning how people behave in groups." Daniel, who graduated with a 2:1 says that studying psychology has also helped him when it comes to working with the local kids. "Being both a cub scout leader and studying at the same time definitely has kept me busy, but I think the two really completed one another. "Being a scout leader you have to constantly plan new activities that will keep the kids entertained, as well as deal with things like behaviour management and different personalities. "Studying psychology was really helpful in terms of helping me understand and relate to both the children and parents I deal with. "I feel I have gained a better understanding of how to interact with children and adults alike - thinking like a psychologist now comes naturally to me." Studying at university has also inspired Daniel to pursue a career in teaching, the perfect way for him to put his scouting leadership experience and psychology knowledge to use. "I really want to continue to work with children and have just enrolled in a teaching Degree. I'm really looking forward to it. I'm sure my psychology Degree is going to continue to be an important grounding for my future career," said Daniel. 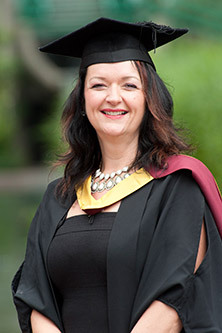 A mother of two from Harlow was among 1,500 students who graduated from City University London recently at a series of ceremonies held in the capital. 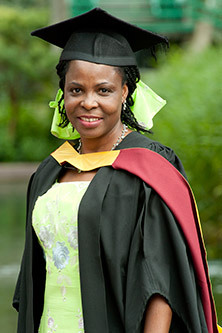 46 year-old Zainab Hannafi completed her Bachelor of Science in International Politics, after moving to London from Nigeria 20 years ago with the hope of gaining an education for herself and her two sons. "I've always been passionate about international relations. We live in a global village where political decisions made in one country can affect another country far away and I wanted to understand the impact of global wars on natural resources, such as land, oil and water. "Growing up in Nigeria I witnessed the impact of the discovery of oil on local communities. I wanted to understand the importance of this so called 'black gold' and why oil has caused so much conflict around the world. "I was also particularly interested to find out more about international governmental organisations such as the United Nations, World Bank, International Monetary Fund and the World Trade Organisation. I wanted to study something that would really allow me to make a difference to the world." For Zainab, attending university was something that she had always dreamed of, but not something she thought would be possible. "I grew up in the northern part of Nigeria, where a girl's education was never a priority. As a young woman, education was always something I desperately wanted and always at the top of my agenda. "I was lucky that my mother was from the west of the country and she pushed for me to be able to attend secondary school. But at age 17 my father decided I should marry. The marriage ultimately broke down and by the time I was 21 I was divorced with two young sons to take care of. "I moved to London in 1991 and made the difficult decision to leave my young children behind with my parents so that I could send money back home to support their education. Over the years I worked hard in a number of jobs, including as a cleaner and database administrator in order to pay for them to attend good schools back in Nigeria. "I paid for my eldest son to go to university in the UK and I'm very proud of him. He now has a Masters in International Marketing and a very good job. My younger son is still in Nigeria, where he is studying at university as well." Zainab says that studying was hard work, but worth it in the long-run and that she would not change it for the whole world. "While I always wanted to go to university, I was working too much and it was too expensive when I was paying for my son's education. After my eldest son graduated from his Bachelor degree a few years back, I decided it was my turn to pursue my dream - it was time for 'Mummy' to go to university. "Studying wasn't easy and at times I found it really difficult, I worked as a minicab driver while getting my Degree and often it was hard to balance work and study, but in the end I'm very proud to have finally completed a university degree. I'm very lucky to have had very supportive lecturers at City who encouraged me to keep working hard. "It is never too late to study and I've shown my sons my transcript. In the end I got a 2.2 and they are both very proud of their mum graduating from university. Now that I've got this far I don't want to stop, I'm thinking about applying for a Masters," says Zainab. 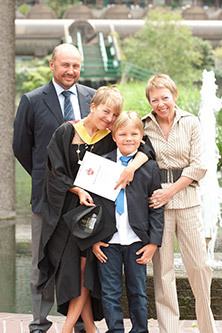 Camden resident Zlata Rodionova was among over 1,500 students who celebrated their graduation from City University London recently. However, it wasn't just completing her Bachelor of Arts in Journalism that Zlata was celebrating, she was also one of a few students who have already had their stories published by one of Poland's leading daily newspapers. About a million foreign football fans and their families are expected to flood Poland in June 2012 for the Euro 2012 Championship. Zlata, who lives on King Henry's Road, was one of 21 students from City University London who was selected by Gazeta Wyborcza, Poland's leading daily newspaper, to visit Poland one year before the country is due to host the championship and report on whether the country was ready for the event. Originally from Russia, Zlata grew up in Luxemburg. She spent nine days in June in the small Polish town of Szczecin where she was given daily tasks related to testing the local transport systems, determining how friendly the locals were towards tourists and of course, sampling the local food. She says: "We set off on a mission to find out whether Poland was ready for the influx of tourists expected when the Championship starts next year. It was really scary at first and I remember sitting on the train on the way to Szczecin wondering if I had made a big mistake - not a lot of people spoke English and I had never been to Poland before so it was hard to get around. "However, in the end I discovered that unlike the drab grey town I expected, Szczecin had some amazing parks and green spaces, it was a really pleasant surprise. "One of the things that I reported on was the fact that a lot of the Polish museums and historical attractions don't have English translations, which was a real shame - this is just one of the simple things that I hope will be addressed as a result of our visit." Mission 21 was also an experiment in the use of social media as a journalistic platform. Zlata used Twitter, Facebook, a blog and YouTube to report on her findings and engage with her audience. During her visit Zlata received feedback and comments from Polish locals and she says that by the end of her nine days she felt famous in the small town. "I would be sitting down to have breakfast and see people around me reading the paper which had my picture in it, it was actually quite surreal." Zlata is now planning to pursue a journalism career. She hopes that graduating from City and having already been sent on an overseas reporting mission will help her stand out from the crowd when she starts looking for a job. "It was always my dream to study in London. Studying journalism at City was a great start to my career; all the lecturers have impressive professional backgrounds and now with my experience in Poland I hope I'll be ahead of the game when I start looking for a job." A vocalist from Oxford was among over 1,500 students from City University London to graduate at ceremonies held in the capital recently. Catherine Jones, who completed a Bachelor of Music and graduated with a 2:1, was joined at the ceremony by her proud parents, who are both musicians. Aged 23, Catherine was born and raised in Oxford, where her family still live. During her Degree she focused on vocal performance and early music. "I was particularly interested in studying in London, one of the world's biggest music hubs. City University London has fantastic music facilities, but I also chose to study there because of the performance links with the Guildhall School of Music & Drama," says Catherine. With her mum being a primary school music teacher and a violinist and her father a musicologist who plays the organ and harpsichord, it's little surprise that Catherine has plenty of musical talent. "I have always grown up with music but first started professional singing lessons at the age of 15. Although I took some time out after I finished school to do some work, it wasn't long before I decided that I was really interested in studying music at university. I completed a Foundation course at Trinity College of Music and then decided to study music at City University London." During her degree Catherine was involved in the chamber choir and also a member of an elite group of singers at the University, Civitas. The group is conducted by Alexander Lingas, a well-respected choir conductor who is also the founder and Artistic Director of the vocal ensemble Cappella Romana in the U.S.
"I really enjoyed having the opportunity to work with Alex during performances; working with such a high calibre professional was fantastic," says Catherine. Catherine now plans to continue her music study and has been accepted into a Masters in Historical Performance at the Royal Welsh College of Music and Drama. "During my degree I also discovered that as well as being a performer, I'm very interested in the academic side of music. I'm looking forward to pursuing both these aspects further," says Catherine.